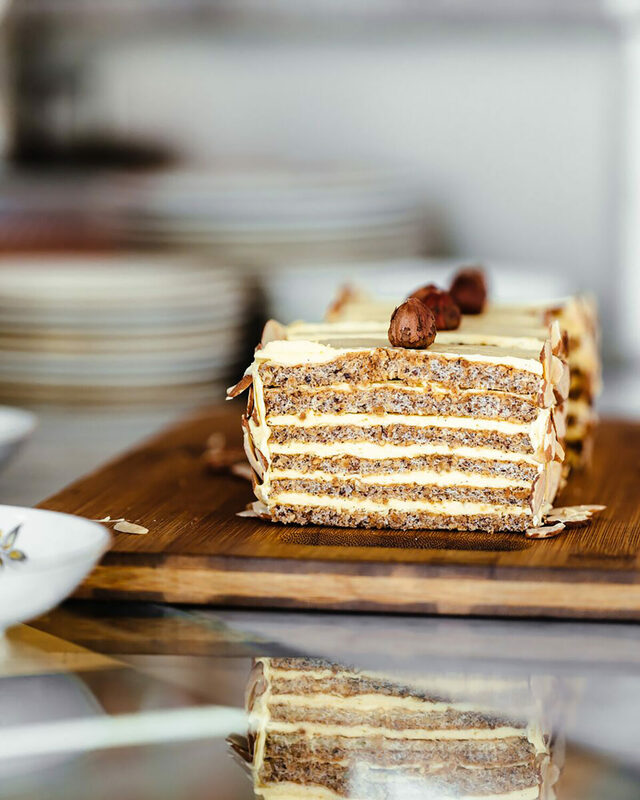 This GF rendition of the famed nineteenth-century Hungarian cake (named after an eighteenth-century Hungarian prince) is one of the best cakes we’ve had, period. We discovered it at the exceptional 20th Century Cafe of James Beard Award-nominated chef Michelle Polzine, and she graciously shared the recipe. Made mostly of finely ground nuts and egg whites, it initially has a meringue-crisp exterior, which makes it surprisingly easy to work with. But once sliced and stacked between layers of frosting, refrigerated, and brought back to room temperature, it becomes soft, delicate, and nothing short of spectacular. Be sure to read through the directions before starting; they’re not hard, but they’re detailed to ensure proper process, which is the secret to success with this ridiculously good gluten free cake. Be sure to read through the directions before starting; they’re not hard, but they’re detailed to ensure proper process, which is the secret to success with this ridiculously good cake. Note: this recipe calls for roasted hazelnuts and Vanilla Buttercream, so plan accordingly. Use the frosting immediately or store it, covered, in the refrigerator for up to 1 week or in the freezer for up to months. Bring it to a cool room temperature before using and slowly paddle it again to restore it to its original consistency (though it will take on a yellowish hue rather than the creamy white one you started with). Make the Cake: Preheat the oven to 350°F. Place the oven rack in the center position. Butter and line with parchment paper 2 (13- by 9-inch) sheet pans or baking dishes. Set aside the 6 roasted hazelnuts for garnish. In a food processor, combine the remaining 6-1/2 ounces chilled roasted hazelnuts with the powdered sugar, espresso, tapioca starch, and kosher salt and grind until very fine, scraping the corners to prevent nut butter from forming. Set aside. In a scrupulously clean bowl, whip the egg whites with a whisk, by hand, or in the bowl of a stand mixer fitted with the whisk attachment, on very low speed, until very foamy. With the mixer running, add the cream of tartar. When the whites become opaque, increase the speed to medium, then slowly add the superfine or granulated sugar in a steady stream, taking a full minute to add it all. (It’s important not to add too much too soon, or it will weigh down the whites and prevent them from attaining maximum volume.) Increase the speed to medium-high and mix until stiff, glossy peaks form (lift the beater from the egg whites; the peaks will be pointy when ready). Scrape the mixture into a large bowl for easier folding. Sprinkle 1/3 of the hazelnut mixture over the egg whites in one layer, then gently fold that in. Repeat for a total of 3 additions and folds. Do not completely incorporate each addition before adding the next; your batter should be homogenous only after the last addition. Divide the batter between the two pans and spread evenly in each pan. Bake until the cakes are golden and dry to the touch, 20 to 22 minutes. Place 2 sheets of parchment paper, each slightly larger than the baking pans, on a clean surface. Immediately go around the edges of the cakes with a knife to loosen them from the pans, then invert the cakes onto the parchment paper sheets. Remove the first pan, then very carefully peel off the parchment paper while the cake is still hot. (It’s very difficult to remove when the cakes are cool.) Repeat with the second pan. Let the cakes cool without moving them. Make the Frosting: Split the half vanilla bean lengthwise. With your hands, use 1 tablespoon of the sugar to exfoliate every bit of vanilla seed from inside the pod. Put the vanilla bean pod, seeds combined with the 1 tablespoon sugar, and the milk in a small saucepan over medium heat and heat to just before the boiling point. Remove from the heat, cover, and let steep for 1 hour. In the bowl of a stand mixer fitted with the whip attachment, whip the yolks and salt with the remaining 1/4 cup sugar on high speed, until the mixture is light, thick, and makes a ribbon when you lift the whip, about 5 minutes. Reheat the vanilla milk to hot but not simmering. With the mixer on the lowest speed, carefully stream the hot milk into the yolk mixture, mixing until combined. Scrape this custard mixture into a saucepan. Clean the mixing bowl. Cook the custard on medium-low heat, whisking constantly, scraping the bottom and the corners of the saucepan as you go, until the mixture just begins to bubble. When the first bubble appears, remove from the heat and keep whisking to ensure even cooking, then pass the cooked custard through a fine mesh strainer into the clean mixing bowl. Whip on high speed until completely cooled, thick, and mousse-like, stopping the mixer to scrape down the bowl, if necessary, about 8 minutes. Scrape into a small bowl. Switch to the paddle attachment and beat the butter on medium speed, until it’s light, creamy, and completely white, about 6 minutes. Reduce the speed to low, and gradually pour in the custard, incorporating each addition before adding more, until it’s completely incorporated, fluffy, and smooth. If you add the custard too quickly, the buttercream may curdle, but just keep paddling to bring it back together before adding more. Build the cake: Set aside 2 tablespoons of the Vanilla Buttercream. Place the almonds in a small skillet over medium heat and toast, shaking the pan continuously, until lightly golden, about 4 minutes. Transfer to a bowl and set aside. Invert each cake layer so that the top is facing up. Divide the remaining buttercream equally between the two cake layers and spread a very even layer of buttercream to the edge of each top. Using a chef’s knife, carefully slice each layer into 3 equal portions, widthwise. Carefully stack the portions on top of each other, lining up all the cut sides together (so you’ll have less to trim later) and reserving the prettiest slice for the top. Chill until firm, at least 1 hour. Trim the 2 short sides of the cake to cleanly show the layers. Slice the cake widthwise into 6 equal portions. Garnish each with 1 whole hazelnut. Push the slices back together in a neat row and spread the reserved buttercream along the short sides of the slices (the long side of the whole cake). Using a small offset spatula or a butter knife, carefully separate each slice. Using your hands, dip the frosted shorter sides of each slice into the toasted almonds. Lightly dust the tops with cocoa powder, if desired. Let the cake come to a cool room temperature and serve with a generous dollop of very lightly sweetened whipped cream.